Also in 1994, two other editors will play their cards with original and devilishly successful games. Primal Rage by Atari (raisen from the dead) stages improbable dinosaurs and other prehistoric creatures in bloody battles with digitized graphics. What Taito tried awkwardly with Dino Rex, the american firm succeeds brilliantly to realize here. Fun fights, varied bestiary, fatalities, gore atmosphere to perfection, nice graphics and sound... In short, a very good game that comes out of the box! Another memorable title is Rare's Killer Instinct, a Nintendo development team that acquire a great reputation with this impressive VS game featuring 2D gameplay. 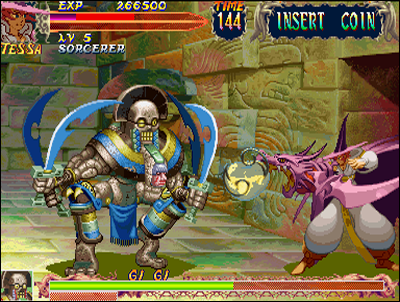 The title impresses a lot upon its release: colorful computer graphics with successful 3D design, zooms, big and beautiful sprites, high-end soundtrack and animation... but the highlight of the game clearly remains its new combo system. 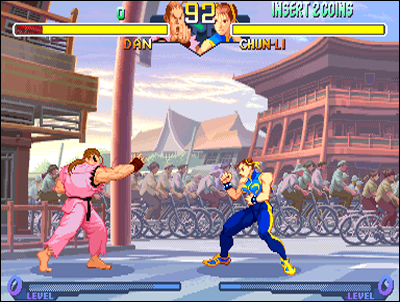 Players have to perform in a specific timing combinations of stick and buttons, to chain the more possible moves. Ultra combos, fatalities ... Rare has thought of everything, and Killer Instinct stands in 94 as one of the essential VS Fighting games. 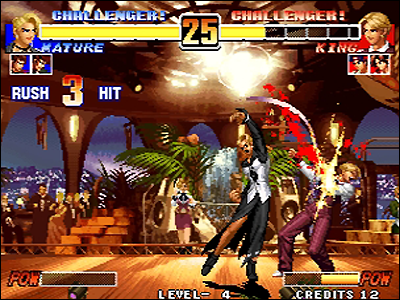 The Neo Geo welcomes a record number of fighting games in 1995, with no fewer than eleven titles! 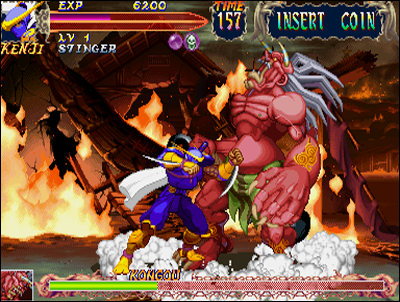 Among them, Hudson Soft's Kabuki Klash incorporates the basics of Samurai Shodown by featuring the cute and colorful Far East of Eden characters; Technos performs the pathetic Double Dragon, and ADK releases World Heroes Perfect. Last episode of this unloved saga, the editor will move onto something else next year. About SNK, the firm is once again responsible for some of the very best VS fighting titles of the year, see: Fatal Fury 3, Real Bout Fatal Fury, Samurai Shodown III and of course The King of Fighters 95, which marks the appearance of charismatic Iori Yagami. 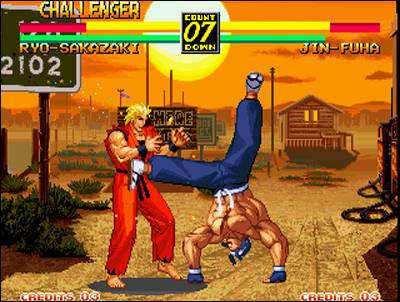 The editor takes the risk of completely renewing the sagas Fatal Fury and Samurai Shodown, defining entirely new gameplay and graphic styles. 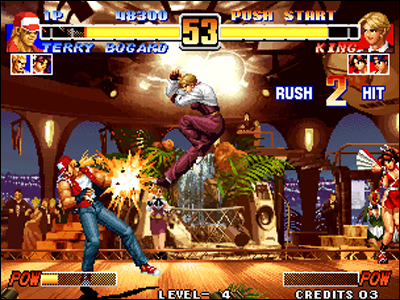 In 1995, SNK and Capcom restart from zero with Fatal Fury and Street Fighter. Capcom's side, othe companies also starts a new saga with Street Fighter, which action takes place before the 'Street Fighter II' series. Street Fighter Zero is a clean slate - like Fatal Fury - and features new graphics, redesigned characters, and a gameplay more flexible and licked than before. The roster is a little thin (ten characters only), but the pleasure of discovery is there. The editor, still very prolific this year, produces Night Warriors which is none other than the sequel of Darkstalkers, and also Marvel Super Heroes in line with the X-Men came out last year. The CPS-II proposes with these titles two gorgeous games featuring fun and easy gameplay. Then in the arcades, players are divided between the SNK games, more deep and technical, and Capcom's ones, accessible and addictive... Two opposite styles which each encounter success, at the expense of competitors, decidedly light-years behind these two giants of the genre. Another releases this year are Killer Instinct 2 and Power Instinct Legends. The first is unanimously considered far less good than its big brother, and the second does not bring much new blood in the saga of Atlus... Indeed, few editors have enough resources and talents to produce sequels constantly improving their predecessors, and finally match the level imposed by the leaders. Capcom and SNK are kings on the 2d fighting game market, while Sega and Namco have significantly won the battle in the 3D genre. Side of the young 3DO, a title of a new genre emerges: it's Foes of Ali. Entirely made in 3D, the soft is the first sports simulation providing 'realistic' boxing: if the parallel is easily done with the Versus Fighting, bases are rather different. The pace slowed considerably in 1996, with only twenty new titles. The videogame market is gradually moving towards home systems, and editors seem to increasingly develop the domestic market; in addition, the first major 3D games are released (Resident Evil, Tomb Raider, Mario 64) and the Versus Fighting begins its transformation into a niche market, as an obsolete genre since the public started preferring the new 3D genres emerging. And it's certainly not the Namco company that would contradict m ... not content with the success of its Tekken and Ridge Racer games on arcades and consoles, the editor releases a new remarkable fighting game, beginning of what will become a fantastic saga: Soul Edge. Tekken 2 engine is reused with new warriors using weapons, à la Samurai Shodown. Bandai puts the final touch on a new Dragon Ball Z game on Super NES, Dragon Ball Z Hyper Dimension. No more long-range attacks, the gameplay is revised and looks more akin to the standards of VS Fighting. Also on console but this time on the Nintendo 64, Rare adapts its hit the arcade, in a console dedicated version: Killer Instinct Gold. The game is a nice adaptation of its impressive predecessor, nicely using the capabilities of the hardware. This is the last game in the series, the editor leaving it to oblivion due to weak sales recorded by the latter. Arcade side, the Neo Geo still holds the top of the poster with no fewer than nine games published this year. 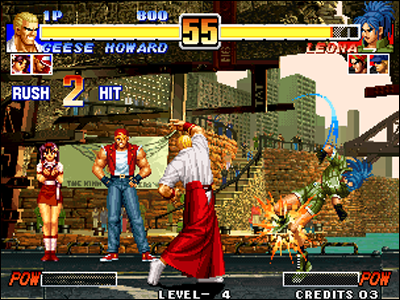 We mainly note Kof 96' which gives a revamp to the series, with all new sprites and improved gameplay mechanics. This is THE technical fighting game excellence. Real Bout Special responds to Real Bout Fatal Fury successfully: the game becomes more smooth and sees its roster expanded. Finally, Samurai Shodown IV substantially improves the third installment and delights fans. Three titles which follow SNK's series illustrious elders, and sit reputation of the company in this area. Also on the market in 1996, Art of Fighting 3 featuring an exceptionally detailed animation and a whole new gameplay. But the app will clearly not meet the success with the players and puts a final point to the saga. There's also Kizuna Encounter which follows the poor Savage Reign (released 95). The game is beautiful, with zooms and large sprites, but offers few characters and too basic game mechanics. However, it's the first to offer a tag system: the player selects two characters and may change its fighter during combat, and even make combinations using both of them! Kof 96, Samurai Shodown IV; Art of Fighting 3, Kizuna Encounter. 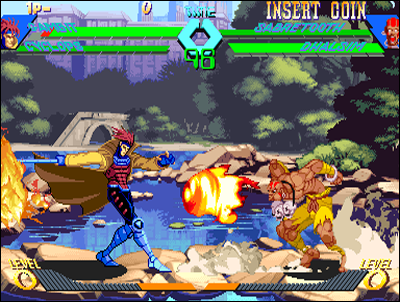 Ninja Masters & Waku Waku 7 are not 'SNK handmade', but yet honor the Neo Geo. 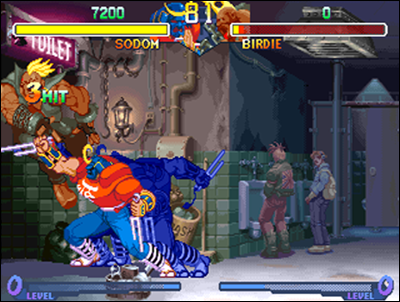 Obviously, Capcom is not left behind in this year 1996, and the editor still leads a fierce competition to SNK on arcade games, with the difference that the Street Fighter company has successfully completed its transition to 3D on the domestic market: Resident Evil is a great success and provides solid founds for the firm. Meanwhile, they launch a brand new arcade hardware, the CPS-III. The machine is a monster of 2D, capable of displaying anything you could imagine on a screen. Red Earth is the first game to be developed on it, and the result is impressive. Unfortunately, it can be played single only, offers too few characters and is quite limited technically. 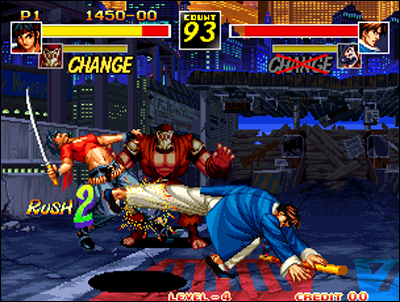 The CPS-II is not abandoned yet, with Street Fighter Zero 2 and its special edition Street Fighter Zero 2 Alpha enhancing the first installment of the new saga, with more characters and combos. 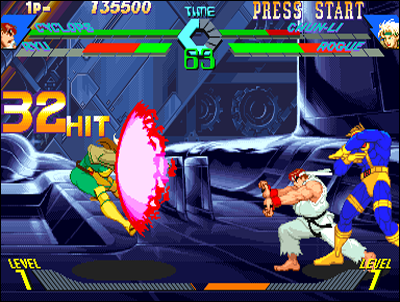 And finally, the players are entitled to a new crossover with X-Men Versus Street Fighter, offering Marvel heroes facing those of Street Fighter: The realization is remarkable and the soft includes a tag, like Kizuna Encounter.